Here are some of those players who took the IPL 2012 by storm with consistently superb performances. The West Indies, or more specifically the Trinidad and Tobago off spinner deserved to win the Golden Player of the Tournament Award in the IPL 2012, which is equivalent to a Man of the Tournament Award. Sunil Narine picked 24 wickets in the 15 matches he took part, and thus was undoubtedly an integral part of the Kolkata Knight Riders side, which recently was crowned the champions of the Indian Premier League. If he failed to pick up wickets or give away many runs or was absent from the team, it made the Knight Riders vulnerable and that shows his importance to the balance of the team. The final against Chennai Super Kings was not his day, but otherwise he had been consistent throughout the competition. No batsman as such dominated him even as there were a few who managed to clear the boundary once off his bowling such as Suresh Raina, AB de Villiers and Adam Gilchrist. The ultimate testimony to his abilities was when he troubled a batsman of Sachin Tendulkar’s calibre for the majority of an over and then dismissed him in front of his home crowd at the Wankhede Stadium. It was in that game that he picked four wickets for 15 runs and virtually ensured that Kolkata was in the playoffs stage before they finished playing 16 league games. His best figures however, in this year’s IPL was 5/19 against Kings XI Punjab at the Eden Gardens in Kolkata. An economy rate of 5.20 shows that he is the brightest talent at the moment for the West Indies in the shorter formats of the game. The million dollar question is – When will he play Test cricket? Another West Indian tops the list, although he is from Jamaica and not Trinidad! If Chris Gayle and Narine join forces for the T20 World Cup side for the West Indies, that teams stands an amazing chance to win the championship in Sri Lanka in September this year. 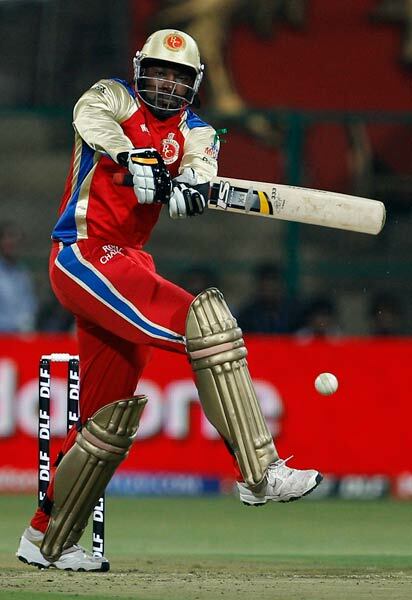 But coming back to the IPL 2012, Gayle proved why he continues to be the finest T20 batsman in the world at the moment. The manner in which the West Indies Cricket Board has treated him since the last two years has been a blessing in disguise for the Royal Challengers Bangalore. He has been the soul of the team owned by India’s richest liquor baron. Without Gayle, Bangalore can hardly compete against the other eight teams and might win a few matches only. Last year, he helped the team reach the finals out of nowhere and was rewarded with the Orange Cap for scoring the highest runs out of all batsmen in the IPL. This year, Chris Gayle did win the Orange Cap again and improved his tally to as many as 733 runs in just 14 matches at a monstrous strike rate of 160.74! But this time, Bangalore finished 5th out of 9 teams in the competition, having agonizingly missed out a place in the last four after making it to the stage since the last three seasons. His highest score was an unbeaten 128 against Delhi Daredevils in Delhi, which should have been rated as the best individual performance of the tournament. Looking at the form he is in, it would not be a surprise if West Indies finally pick him again to play England in England. The home team, better watch out for the Gayle Thunder! The captain of the Numero Uno team of this year’s IPL, Gautam Gambhir was outstanding as captain on the field and with the bat. Gambhir was just the man the Knight Riders needed to inspire them to victories, aggressive in attitude and not accepting to be second best in any game. These qualities spread like wildfire in the team, and it showed in the body language on the field. There did not seem to be any mistrust or division in this KKR team, unlike the first three seasons and they played like a family, which is a prime reason for their success. The irony or the beauty of it all is that Gambhir was the major pillar of the Knight Riders this year. Yet, he gives all the credit to his team and believes that his team makes him a successful captain, and not vice a versa. With the bat, the Delhi opener scored 590 runs in 17 matches at a strike rate of 144 and an average of 37, which is a terrific achievement considering the pressure he always is in for being the captain of by far the most popular and publicized franchise of the IPL. These statistics to an extent indicate that Gambhir continues to be one of the best batsmen in the world, even if he has had a rough year after the World Cup 2011. He singlehandedly made Shah Rukh Khan happy as Kolkata won game after game. Without his huge contributions, the Knight Riders can win matches like they did in the final against Chennai but they would have definitely lost more league games looking at the form of the other batsmen in the side. His highest score was 93 against Royal Challengers Bangalore in Kolkata and that was an important game for the Knight Riders to win, due to the mental block Gayle and co. could create. A true leader and a fabulous batsman, Gambhir could be back in contention to be India’s next captain in the future, once Dhoni quits. 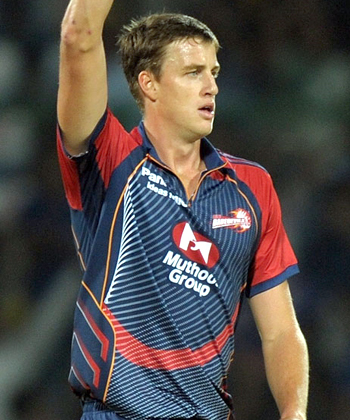 Morkel might have been on the top of this list, had Delhi Daredevils gone on to win the IPL 2012. Morne Markel was the highest wicket taker in the competition, with 25 wickets to his name in 16 matches. Incidentally, Delhi lost both the games he was ‘rested’ in, one of them being a virtual semifinal game against Chennai Super Kings in Chennai. This decision will continue to baffle all passionate Daredevils supporters for some period of time, because this was their best chance of winning the IPL out of the five years. It is good to have a power packed batting line up, but not good enough because bowlers have over time proven that T20s are also won by them. Morne Morkel was needed by the Daredevils to fire, although the batting lineup had the likes of Sehwag, Warner, Pietersen, Taylor and Jayawardene. He did so, even as his achievements were at times forgotten. In fact, Morkel’s presence was soothing for the rest of the bowling attack because they wanted guidance from a bowler of his class and experience as in how to bowl precisely in the T20 format. Morkel was stereotyped to be a Test bowler a year ago, but has vastly improved in the shorter formats of the game. Kolkata Knight Riders were the first victims of his ‘new’ yorker length deliveries which he unleashed in the very first match they played in the IPL at the Eden Gardens. He has now become more reliable in the death overs, which was seen in the game against Rajasthan Royals in Delhi which the Daredevils won by 1 run out of nowhere. He bowled the 19th over for just 3 runs and picked a wicket too! This is good news for South Africa, a team which has produced some of the greatest fast bowlers of all time. He is back in contention for his country’s World T20 side and in ODI cricket as well. Another Delhi opening batsman playing for another IPL team did wonders in the tournament with his individual performances. Shikhar Dhawan got the chance again this year through the IPL to display his enormous talent to the Indian selectors, and he did it in style. He was the only shining light in an otherwise dull Deccan Chargers outfit, with 569 runs in 15 matches at a stunning average of 41 and a strike rate of 130. Deccan had some hope of winning as long as he was at the crease, but the moment he was dismissed, the team could hardly lift themselves up. Personally, he would be flattered with such an observation since he is still a rookie opening batsman. Shikhar Dhawan’s highest score was 84 only, but such was his consistency that he went past his fellow Indian who is also an opener, Ajinkya Rahane. If Dhawan would have been in one of the top four teams this year, he would have gained recognition more easily for his achievements. It was unfortunate that Deccan could not make good use of his contributions and win more matches than they could have. Astonishingly, he scored more than 50% of all the runs the Chargers scored this season, even with the presence of T20 geniuses such as Cameron White and JP Duminy and Kumar Sangakkara, a veteran batsman and not just the captain of the side. One can feel very sorry for Dhawan, who was also decent for Mumbai Indians in the third season when he got the opportunity to open the batting with Sachin Tendulkar and learn from that experience. Hopefully, he should get some justice for his talents by being selected soon in India’s ODI team because the selectors like to follow a rotation policy these days. How can this man not be there on such a list when he is playing the IPL? 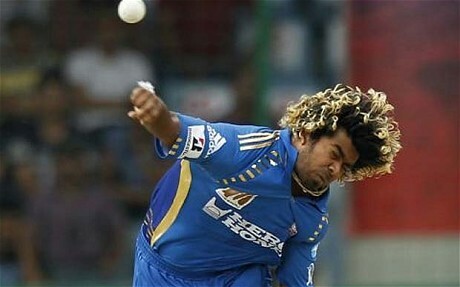 Malinga continues to be a powerful storm to contend with for any opposition, and an asset for the Mumbai Indians. Although this season he was not as lethal as he was the last season, he ended with 22 wickets in 14 matches which made him the third highest wicket taker this year. Perhaps his injury came at the wrong time, and Mumbai did struggle despite having a dearth of pace bowlers in their squad to replace him. Mumbai may have the strongest bowling attack in the IPL in terms of T20 cricket, yet Malinga is easily their spearhead till date. His four overs often get the team wickets as he always looks to pick wickets and nothing else. Even if he is not 100% fit, he will give it his best for a team that has given him huge hopes of leading a life of happiness inside or outside cricket. It is not just due to the money he earns from Mukesh Ambani, but the family like treatment given to him by the Mumbai Indians team management and the players alike. His contributions have seen Mumbai make it to the playoffs stage for the third consecutive year, but it was unfortunate that they could proceed to win the IPL. ‘Slinga’ Malinga is one of the best T20 bowlers in world cricket, yet even the best can succumb to pressure and this is a weakness Malinga must overcome if he has to improve and help the Harbhajan Singh led team defend the Champions League this year or win the IPL next year. He plays for Mumbai in the Ranji Trophy. Yet, the Rajasthan Royals seems to have given him a new lease of life when it comes to increasing his chances of playing for India on a regular basis. The diminutive opening batsman had taken the IPL 2012 by storm, being the Orange Cap holder for a long period of time until Chris Gayle finally overtook him by a huge gap. 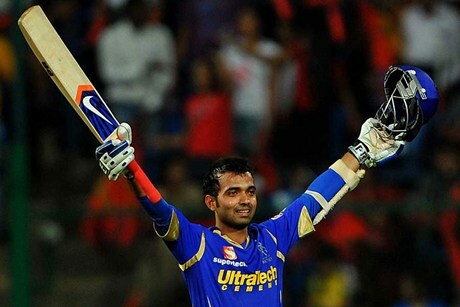 Ajinkya Rahane scored 560 runs in 16 matches at an average of exactly 40 and a strike rate of 130. He will be known as the first centurion of the IPL 2012, with a hundred against a stronger Royal Challengers Bangalore side in Bangalore. Rahane has this amazing ability of keeping calm while being aggressive at the same time, when he is batting. He has been predominantly been a defensive player, having played a huge amount of Ranji Trophy cricket for Mumbai and gained a name for himself there in the ranks of Indian cricket. Yet, he has not transformed but improved his style of batting to score at a much quicker rate than before. Hence, it is no surprise when he was picked for India’s tour of England last year in the ODIs and T20s and played a couple of good innings there. He is certainly India’s potential batting talent for the future in all formats of the game, and being from Mumbai one can say that he is a mixture of Gavaskar and Tendulkar. Hopefully, the IPL should help him move forward rather than backward. The Vidarbha pacer continues to impress one and all with his exceptional pace bowling. He just loves the IPL to prove a point that he can be an Indian pace bowling legend in the long run, joining the likes of Zaheer Khan, Javagal Srinath and Kapil Dev possibly. Delhi Daredevils have kept him in their side for the last three seasons, due to his consistency and knack of reveling in the T20 format, even when under pressure. 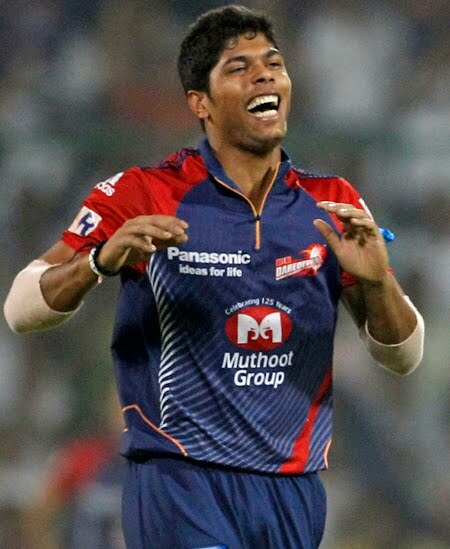 Alongside Morne Morkel, Umesh Yadev formed the best fast bowling partnership of the IPL undoubtedly. Yadav’s pace can trouble any batsman in the world, irrespective of the conditions. He has been able to bowl around the 145 km/hr mark regularly and that has made the Daredevils look a complete all-round team. Thus, they were hard to contend with in the league games. He picked up 19 wickets in 17 matches, enjoying being in the back seat while Morkel led the attack with intensity. But he too can easily falter in pressure situations and perhaps experience can be the best teacher to help him overcome this weakness. If he can improve his state of mind, he could be more than lethal and hard to counter. Plus, he would have to improve on his variations as well. So he continues to be good, but he can become much better than what he is. This list has more Delhi Daredevils players than those of any other team. It goes to show how Delhi somehow thrived this season because of being a team of individuals, but could not perform as a team in the playoffs stages which was the key reason why they lost to Kolkata Knight Riders in Pune and Chennai Super Kings in Chennai. Sehwag is the third Daredevil on this list, and the captain had yet another fine season for his home franchise. Last year, he was the last man standing as he saw his team crumbling in almost every game. This year, he had much better support from the batting lineup and that made him bat better and lead on the field more calmly. He scored six fifties on the trot as he finished with 495 runs in 16 games, at an average of 33 and a strike rate of 161! These statistics made him the fifth highest run getter in the IPL this year and the highest run getter for the Delhi Daredevils for the second year in a row. 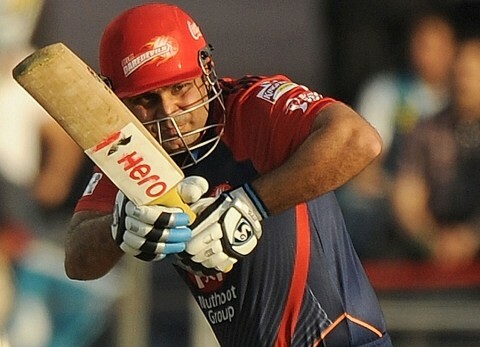 Sehwag’s style of batting fits the T20 format but even he rarely performs for Delhi or India when it matters the most. It is unfair to expect him to become more aware of the match situation and bat, but then experience should make Sehwag understand this. However, he continues to entertain crowds and remains one of the reasons why many still watch the IPL despite the controversies it has been in, in the last month or so. 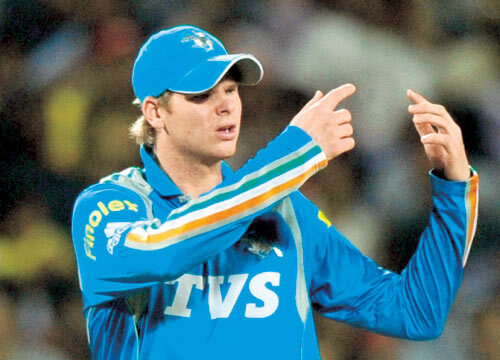 He is the only man who made many believe that Pune Warriors India had the team to make it to the playoffs this year. Sourav Ganguly might be emotional and aggressive as captain, but he has a street smart cricketing brain and it is hats off to him that Steven Smith got an opportunity to represent Pune in the IPL this year. Smith was unlucky to have missed out on the IPL for the last two seasons, due to injuries after he was picked by Royal Challengers Bangalore in 2010 and the now defunct Kochi Tuskers Kerala in 2011. Smith has been one of the emerging talents in Australian cricket, and such has been his rise that he had made it to the Australian team at the age of 20 despite actually being a leg spin bowler. Although he has not been able to cement his place in the national team, he has been favoured tremendously in the T20 format. So much so that Sydney Sixers made him their vice captain for the Big Bash 2011 and the team won the title under his captaincy in the final. It is his ever growing maturity as a cricketer which is finally paying off and he has shown his capabilities to the entire cricketing globe. 362 runs in 15 matches are not big numbers but he has batted unfortunately lower down the order frequently in the IPL 2012. Thus his highest score is a meager 47 not out, and he has an average of 40 and a strike rate of 135. Ganguly did well to pick him, but did not use him appropriately even as he won Pune 3 out of the 4 games the team prevailed in this season. His fielding was outstanding and saved Pune a tremendous amount of runs, which made oppositions work hard to put up big scores against the bottom ranked side of the season. The reason of his brilliant fielding is a mélange of athleticism and dedication, which makes him a sight to view for any cricket fan whether he loves or hates Australia! He could have bowled much more in the competition, but Ganguly was inert to changing the bowling strategy of the team and had to pay the price for it as a result. He is unarguably the world’s no.1 fast bowler in all the three formats of the game still. Steyn remains an asset for any team to have, but then again he is with the Deccan Chargers. The team struggled throughout the competition having only beaten their partners at the bottom of the points table, Pune Warriors India twice. Shikhar Dhawan and Dale Steyn acted as a two man team for the Hyderabad franchise which is now used to more losses rather than victories. Steyn can do a lot, but he is no Superman, is he? Yet, the South African fast bowler gave it his best at all times in the competition and bowled fiery spells. Against Mumbai Indians in both the encounters, he reveled as his speed and swing got his fellow countryman Richard Levi out twice and troubled the likes of Rohit Sharma and Sachin Tendulkar to an extent. 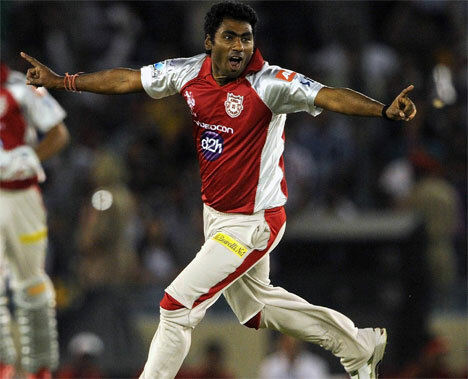 He holds the record of the fastest ball in the IPL, that of 154.5 km/hr! One word for it, incredible. Period. He had one bad game, against the Royal Challengers Bangalore in Bangalore when another fellow South African, AB de Villiers launched a freak assault on his fast and furious deliveries. But he hit back hard against the same opposition by picking up 4 wickets as Deccan beat Bangalore in Hyderabad, and knocked them out of the tournament. This shows Steyn’s fighting abilities and what separates him and the rest. He also proves that there is a place for conventional fast bowlers in T20 cricket, even as batsmen try to target them as much as possible. He finished with 18 wickets in 12 games at an economy rate of 6.10, amazing figures for any bowler in this format of the game. He is the third South African to make this list, which can indicate what a potentially dangerous team the Proteas can be for the upcoming World T20 in Sri Lanka. du Plessis decided to make the IPL 2012 his own, once he got the opportunity to open the batting for Chennai Super Kings in the absence of Michael Hussey at the start of the competition. He was in strong contention of the Orange Cap and wore it as well in some of the matches, which is a big honour for a player who has not got enough chances to play for South Africa. du Plessis got the opportunity to rub shoulders and play against some of the best players in the world and clearly learnt from this short (albeit long!) outing in India. He did not get to play last year at all, but this time he made the opportunities count by 398 runs in 13 matches at an average of 33 and a strike rate of 131. His contribution of 73 against Royal Challengers Bangalore in Chennai changed the team’s morale as Chennai which looked woefully out of form before that game, won and then started winning slightly more. He was unlucky to be sitting out once Hussey returned from West Indies, but he can always be a feasible option for Chennai Super Kings in case they wish to strengthen their middle order batting and leave out one all-rounder or bowler. The Punjab fast bowler would be proud of the fact that he has ended up as the 7th out of the top 10 wicket takers in the IPL 2012. Unfortunately, his 20 year old team mate Mandeep Singh won the Citi Rising Star of the Tournament Award when it could have gone to him as well. Awana is another example of an Indian fast bowling talent, who if groomed could become a regular in the national side and thrive in it. He is lanky and has the pace to trouble batsmen at times, if not regularly. After all, to pick the wickets of Virat Kohli, Rohit Sharma, MS Dhoni and Virender Sehwag is no mean achievement for a young and rookie fast bowler. He bagged 17 wickets in 12 matches at an economy rate of 7.91. He does have a long way to go, but kudos to David Hussey’s captaincy because the Australian backed him to perform time and again irrespective of the opposition and the situation of the game or his inexperience. For Awana, Adam Gilchrist’s injury must have been a blessing in disguise since Gilly seemed to favour Harmeet Singh over him while Hussey was the opposite! An India cap is not far away for Awana, it is only a matter of time and immense consistency of performances that should get him that as India has always been struggling to search for pace bowlers. When he was removed by the Mumbai Indians, cricketing pundits and some fans were stunned. Many times, he had won that team matches and it was Bravo ironically who recommended Mumbai to acquire Kieron Pollard, his Trinidad teammate in 2010. Yet, it can be said now that Mumbai’s loss is Chennai’s gain. Chennai could see the value this man can bring to a team, because he is an all rounder who is equally good at batting, bowling and fielding and that is the logic with which he was purchased by the two time IPL champions in the 2011 IPL auction. He is another West Indian who has actually benefitted from the callous attitude of the national board. Bravo has got a fine chance to play cricket for a couple of weeks with Chennai Super Kings and not just earn a lot of cash, but also learn so that he can improve his game. Alongside Albie Morkel, Bravo made Chennai this season much stronger on paper. His contributions were vital to make the Super Kings reach the final for the fourth time in five years, after they managed somehow to make it to the playoffs stage. Bravo was handed over the responsibility by Dhoni to bowl the last over in the final against Kolkata, something which he is extremely efficient at. Unluckily, he could not defend 9 runs for his side and was perhaps his only major failure in the tournament. Yet, he did pick 15 wickets in 19 matches and with the bat, scored 371 runs at an average of 47 and a strike rate of 140.53! He was the finest all-rounder of the competition, because his fielding was breathtaking and some of the catches he pulled off were as brilliant as those of Steven Smith. Sunil Narine is still a mystery, Viru was impressive, Gayle started slow but finally took off. You missed Ab De Villiers? I still wonder why West Indies is such a weak team despite having such smashing Cricketers. If they make a team out of these IPL West Indians then they are capable of defeating any team in the world. Somebody also suggested me to add Azhar Mahmood or AB de Villiers but their performances were not that outstanding as compared to these 14 cricketers… I think in context of RCB, they continue to be dominated by Gayle’s performances. If WICB does make the West Indies team for the World T20 especially, on the basis of the IPL performances, this team would be hard to beat. But the team always has great individuals who cannot perform together as a team and this is why they continue to be weak.